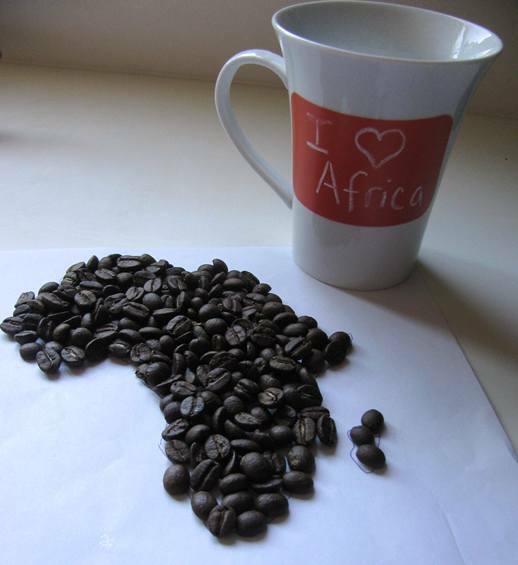 Many of my friends already know how much I love coffee, African coffee in particular. The thing is: I used to like coffee; but only a little. I always thought coffee was OK and I never really felt that “kick” that many people drink it for. So, it was a beverage like any other. Honestly, it didn’t even rank in the top 3 for me. I was never able to understand when people spoke of how dreary their day was because they hadn’t had their morning cup of Joe. I used to meet friends at the local (or large chain) coffee shop and sit and sip a latté. But it was the experience, not the drink that made me truly happy. I didn’t need the caffeine and could even have a cup immediately before going to bed with no real effect. I had purchased those expensive whole bean coffees, bought an espresso machine, dealt with cleaning the blasted thing and still I couldn’t identify with those “coffee snobs” who talked about what was in their cup the way some people describe wine or expensive Cuban cigars (No, I’m not recommending you start smoking!). Terms like: bold, fruity, notes of chocolate… Frankly, they meant nothing to me. Man, have times changed! You see, ever since I starting selling fair trade (and often organic) African coffees… I fell in love. I had no earthly idea what I was missing all of those years! Once I learned “the basics” from my coffee roaster, my life was changed. I’m talking night and day here! I still remember that first shipment of freshly roasted African coffee: I didn’t even have to open the box to smell it: incredible to the senses! I ground a batch immediately and put it into my regular old Mr. Coffee, adjusting the setting to “strong”. With those few little bits of advice from our roaster… my life transformed. I still don’t feel that “eyes wide open” feeling that many of you get from coffee. But, I smile a little bit less in the morning when I don’t have my “cup of Africa” as we call it in my house. You see, I am in love with African coffees now. In love with the deep rich flavor that comes with freshly ground beans that wree roasted just days before. I’m going to share with you the tips that I’ve learned over the years. Some seem elementary; but if you are used to that “other stuff”; many of these steps aren’t worth the time they take. After all, if you are using coffee that was ground months ago… the type of water might not make much difference! Try these steps though… all of them… and you might just find out what I did: Coffee is magical. It’s a way to enjoy travel: Every morning, I feel like I’m sitting with a dear friend in Ethiopia, Kenya, Zambia or Zimbabwe and drinking in the sounds and sights of Africa while sipping that simple pleasure called coffee. Join me! Believe it or not, you really don’t need an expensive espresso machine to make a great cup of coffee. Always use freshly roasted beans. Coffee loses flavor over time; so freshly roasted beans are always your best bet. Clean your grinder and coffee brewer regularly to prevent build-up of oils which can alter the flavor of your coffee and eventually give it a rancid flavor. Grind your coffee beans immediately before brewing. Exposure to air slowly makes coffee grounds taste stale. Use the right setting on your grinder (depending on your brew method). Don’t be afraid of making mistakes: start with 2 tablespoons of coffee per 6 ounces of water. Adjust based on your personal taste. The higher the quality of the water, the better the quality of your coffee. When making drip coffee, it is best to stir or swirl the pot when finished to thoroughly mix the coffee because the coffee toward the bottom will be stronger since it was brewed first. If you are making your coffee in advance; don’t leave your coffee on the burner or warmer or it can scorch and change the flavor. Use a thermos instead. 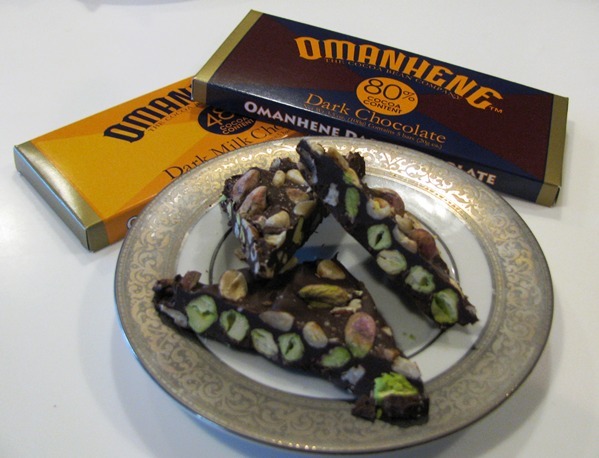 No chocolate makes me happier to work with than Omanhene! It’s delicious, ethically traded and 100% made in Ghana from bean to bar… what’s not to love? I must say I enjoyed taking a quick break to challenge myself to improve an already wonderful chocolate and creating this little gem of a dark chocolate bark*. It only took a few minutes to make. I love each of these ingredients on their own and I can tell you that they work together like some of the best a cappella music groups in South Africa… heavenly! Toast pistachios, hazelnuts pine nuts– or whatever nuts you have on hand– then sprinkle on top of melted chocolate (let them cool first). Tap to ensure it sets into the chocolate. 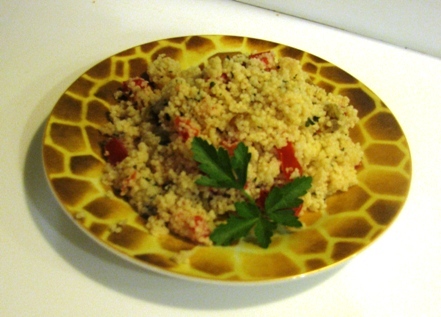 The thing I love about couscous is that, like pasta, it is so flexible! 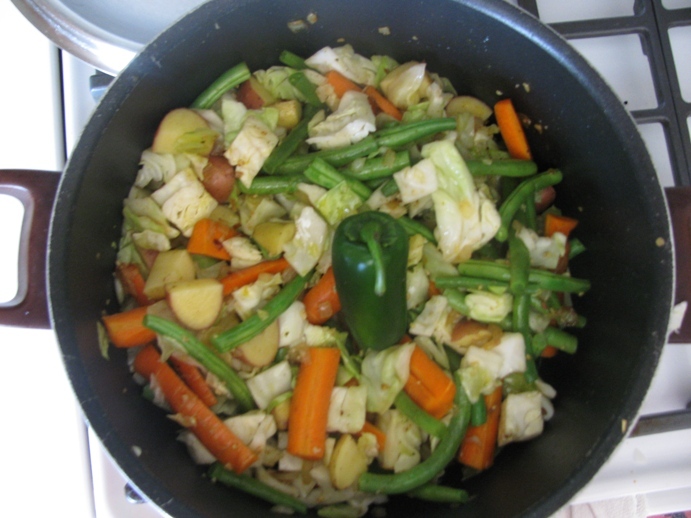 Yesterday, it was used in a four ingredient, vegetarian dinner that I think you’ll enjoy either hot or cold. North Africans love couscous and so do I! I know a lot of people look at couscous and think that they need to have an exotic recipe from some far away land in order to buy it at the store. For many, because it is a type of food that they’ve only vaguely heard of or seen once in television cooking show featuring Moroccan food, it intimidates them. I’d like to remove the mystique for you. When one of my children asked me what it was, I described it this way “Its pastina’s cousin.” She looked at it and thought of “pastina” (literally “tiny pasta” that we use in Eritrea to make for babies or toddlers at home, topped with butter… yes, there is that Italian influence in Eritrean cooking again!). Aleecha: a common Eritrean dish made of curried vegetables which you are sure to love. Many years ago one of my children’s friends entered our home for the first time. He was only 7 at the time. A really nice kid with one of those great big smiles that could melt a mama’s heart. I’ll never forget it… as he walked in the door, I overheard him say: “Wow, it smells like Africa here!” He was right, it did smell like Africa. I was making a traditional Eritrean meal for dinner: injera, tzigny, aleecha, salad… the works. Some years later, when I opened Mama Afrika in a “brick and mortar” shop; I heard the same thing of the store. “It even smells like Africa”. I read once that our sense of smell is what links us the closest to our memories. Of all our senses, it isn’t sight or sound… its smell. And each time that I cook aleecha, it reminds me of my mother cooking over a hot stove when my aunts or her friends came to visit. Since I love food and I love Africa, I’ve decided to share recipes from time to time on my website which will help you bring the smell of Africa into your home. And, of course, it will also bring the color and rich wonderful flavors of Africa cuisine into your home too! Here is my first dish: Eritrean Aleecha, a vegan dish that is sure to please you, your family and guests. It is a quick, inexpensive and delicious dish to make. I was inspired to chose it after a recent trip to my local organic farmer’s market. The carrots were beautiful, sweet and I couldn’t leave home without them! I like dirt on it, bugs coming out when you rinse it kind of veggies. I like being reminded that they come from the Earth and that the farmer can tell me what to do with it, how to select the best one and sometimes, yes they even tell me “Oh, you don’t want that this week; they’ll be better next week”. That is what personal relationships do. They teach us and they give us reasons to smile. 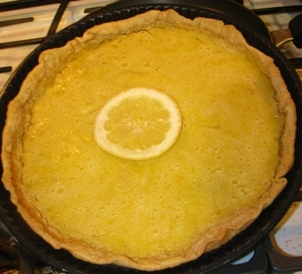 Tarte au Citron, from France because the lemons looked absolutely fabulous! They were bright, spring-like in color and with an aroma that called me from across the stand. Preheat oven to 190C (375F). Roll out the pastry dough and line a 23 cm (9 inch) round fluted tart tin. I often just buy pre-made pie crusts in the refridgerated section of my grocery store, if time is an issue for me. If you use a pre-made pie crust, remember to let it sit at room temperature for 10 minutes before rolling it out and putting it in your tart tin! To make filling: Wisk together sugar, eggs and egg yolks. Add the cream, then the lemon juice and zest. Pre-bake your crust at 190C/375F for about 10 to 15 minutes. You can use baking beads, dried beans, or rice… whatever you usually use to keep your pie crusts flat on the bottom as they bake(until cooked, but still pale in color).. I have even used a fork to poke small holes in the (bottom only!) of the pie crust before baking; and that has worked fine for me. Put the pie tin on a baking tray and carefully pour the filling into the pastry case. Return to the oven for 35-40 minutes, or until the filling has set.